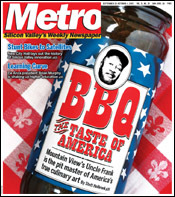 Mountain View's Uncle Frank is the pit master of America's true culinary art. De Anza's Brian Murphy is shaking up higher education. The Fly: Measure C Déjà Vu? Silicon Alleys: Infidels and Other Subversives. Rev: Berzerkley: Now, Berkeley has announced that it is following the Kyoto Protocol to reduce greenhouse emissions. Hall of History: From daring cyclists to Dictaphones and panoramic views of the old days, the new City Hall features slices of the valley's past. Far Future, Old West: 'Serenity' boasts space outlaws, space Apaches and the best space captain since Shatner shed his velours. Men With Guns: David Cronenberg's 'A History of Violence' shocks an Indiana family out of their peaceful lives. Jingles Jangle: Julianne Moore plays a '50s housewife on a winning streak in Defiance, Ohio. No More Drama: With Digable Planets a not-so distant memory, Ladybug Mecca looks to the future. In Flames: Mexican rockers Molotov boast of cajones as big as grapefruits. Book Box: 'The Algebraist' by Iain M. Banks; 'The Root of Wild Madder: Chasing the History, Mystery and Lore of the Persian Carpet' by Brian Murphy. Have Fun Storming The Castle! : Two Mediterranean restaurants provide a bastion of culinary refuge in a high-tech landscape. Live Feed: Food Critic Secrets. 5 Things to Love: Good Korean Restaurants. The Proof Is in the Play: David Auburn's family math adds up in City Lights production.